PodRide is a four wheeled bicycle with full body, giving a dry and safe ride in all weathers. Run the electric motor and just Cruise along or turn it off and exercise, bike to work all winter, park free in the city center, skip the traffic jams, use both roads and bike paths, no uncomfortable saddle, no driver’s license, cheape to run and great for the environment. 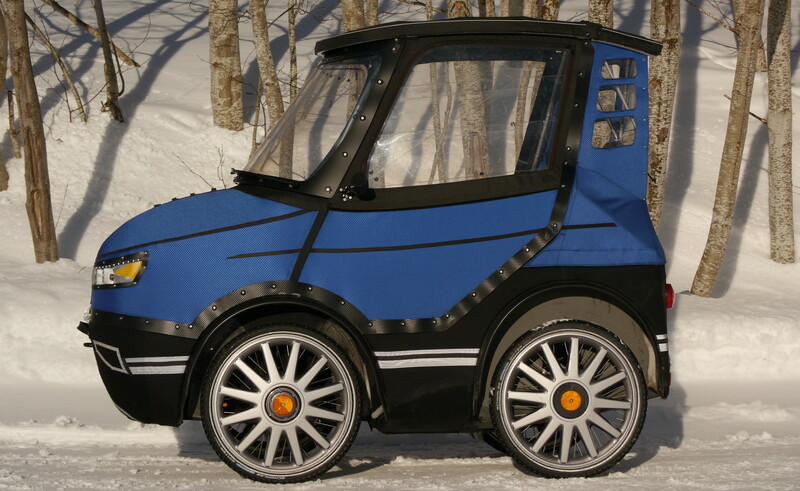 PodRide is a velomobile that is meant to be a practical every day vehicle. It has approximately the same sitting position and seat height as a small car, allowing easy access and good visibility in traffic. It has four wheels to be narrow enough for bicycle paths but still be stable in the curves. It has a full waterproof body to keep you warm and dry in any weather, heated windshield with wipers, soft seat with back support, air suspension and studded tires in winter. A small trunk for your shopping bags and a hitch for a bike trailer when you want to bring your kids. The electric motor and the battery are the same as on an electric bike so it is legally a normal pedal cycle and may therefore be operated on bicycle paths and without a license. My assessment is that with large-scale production the price would be 2-3000€. And then I think many people would be interested. Today they sell 60 million cars and 130 million bicycles per year in the World. There are over 1 billion cars in the world now. If one percent of that market could be made to choose a vehicle that is a cross between a car and a bicycle, it will be 1.9 million units. 1.9 million units with a sales price of € 2,500 resulting in revenues of € 4,7 billions. This is just speculation, but there is certainly potential if you succeed! With the environmental and traffic problems we have today as background I believe the trend will move toward small energy efficient vehicles. And in the long term 20-30 years, I think it will be sold more small PodRide-like vehicles than passenger cars. Support my project, make a contribution on the link below and share it with your friends, thanks.